"You get what you pay for" isn't just a cliché your dad taught you about buying good quality products. Price is obviously always a factor when shopping for new technology. Going with the most expensive product out there will blow your budget apart pretty quickly. However, cheapest is not always best either. Many are drawn in by "free" content management software. While open-source CMS platforms such as WordPress, Drupal and Joomla are being used by millions of websites today, that doesn't mean these companies are truly using the software for free. 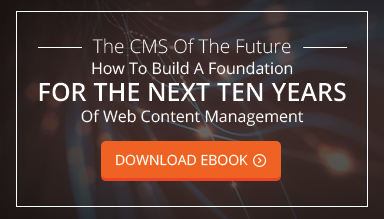 When weighing the decision to go with open-source, proprietary or a custom-built CMS, consider all "costs" associated with installation and future growth, and remember that "free" CMSs still cost money. What is Involved in Costs? Money. Hard numbers are what grab our attention the quickest. Many companies quickly realize their "free" CMS can't do exactly what their workflow requires. Soon, they find themselves with multiple third-party applications, with either no integration or they must pay an expert to help them patch everything together. Depending on the work you need, consulting fees can range from $100-$200 per hour (or more), which can turn into thousands for a full-scale project. That "free" software quickly turns into a large investment, and the result is still a technology infrastructure that is like a patchwork quilt. Productivity. Never underestimate the importance of employee buy-in to new technology. CMS software is often used by multiple employees, affecting productivity across departments. One survey found that 78 percent of employees take considerable time to "come up to the learning curve" when embracing new technology. Imagine the considerable loss in productivity if the "free" CMS isn't effectively meeting their needs. Having to change to another CMS or having to introduce multiple third-party products to make the free CMS work will only expand the learning curve, decrease productivity and cost the company money. Stress. It's stressful for you and your employees when the right tools are not available. Reduce stress by giving employees a custom CMS that is built specifically for their workflow. Providing the right tools is about more than just shortening the above-mentioned learning curve. When a late-night urgent change needs to be made, the right tools will enable a stress-free update. How important is that functionality? One Gallup poll put it this way, "When employees have what they need to do their jobs, they will commit to almost anything the company is trying to accomplish." Not having the right tools creates a stressful environment and disengaged employees that are unwilling to go the extra mile to meet the company's mission. Your CMS is more than just a tool to make website edits. It's a way to manage data, promote your brand, collect prospect information and implement an effective conversion strategy. As your company evolves in these areas, so must your CMS. When thinking about what platform to implement, look beyond the costs. Consider the following factors. Does the CMS meet my current needs? Where do I see my company in two to five years? Will this CMS still meet my needs? Will the CMS streamline workflow? How much training will staff need?